After terrific achievements such as Ain’t Them Bodies Saint (2013) and Ghost Story (2017), American writer/director David Lowery is definitely a name to be followed closely. 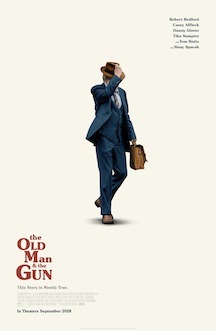 Despite of the low-key vibe of The Old Man & The Gun, a biographical drama film about the ever-smiling robber and prison-escape expert Forrest Tucker, he doesn’t disappoint, weaving enjoyable episodes through a fusion of non-violent crime and sweet romance. For the script, Lowery based himself on an article by David Grann published in 2003 on the The New Yorker. Supposedly, this is the last theatrical appearance of 86-year-old actor Robert Redford, who announced his retirement last August. Impersonating Tucker with that habitual devotion he always dedicates to his acting roles, Redford is joined here by Sissy Spacek, in what was their first collaboration on the big screen. The latter plays Jewel, the woman who conquers Tucker’s heart without being able to make him stop from robbing banks like a gentleman. Partnering with longtime pals Teddy Green (Danny Glover) and Waller (Tom Waits), Tucker never leaves prints, raises his voice, or makes any kind of fuss when operating his scheme. This happy fellow probably never shot a gun in his whole life, not even when escaping from prison, a feat he successfully completed 16 times. Nonetheless, his well-calculated maneuvers became objects of study of police detective John Hurt (Casey Affleck), who is visibly intrigued by and embarrassed for a ‘clean’ robbery executed by the time he was inside the bank. This efficient account charms with a breezy fluidity, also displaying decorous looks and settings that conjure up that slightly opaque glow of the 1980s. The witty dialogue between Redford and Spacek feels refreshingly romantic, with Lowery abdicating of typical clichés in favor of a tangible honesty that burns with irony, love, and glee. Being a film of minor tensions, The Old Man brought me joy in the quantities required to make it noteworthy.